Dr. Hakim provides dental implants to Windsor and Kingsville area patients with damaged, decayed missing teeth. Tooth loss can occur due to accident, injury or disease. Prior to the use of dental implants, dentures were the only alternative for replacing missing teeth. Dentures are not always the most practical solution, especially when only one or two teeth are missing. Dental implants are permanent replacements for lost teeth. Missing teeth can cause many problems that dental implants can prevent or correct. Where one tooth is missing, other teeth may spread or drop, affecting and possibly damaging the bone structure of the jaw. Bone deterioration can ultimately lead to deterioration of the facial structure, and many more health problems. The implants consist of titanium posts placed into the jaw bone in the spaces where teeth are missing. The bone of the jaw bonds with the titanium, strengthening it and creating a solid foundation for the artificial tooth connected to it. 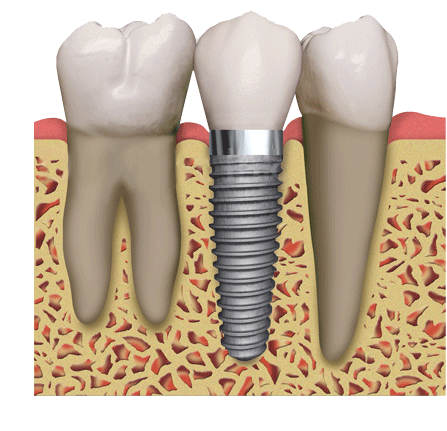 Once the implant is in place, an artificial tooth is permanently fixed to the titanium post. The artificial tooth is custom made to replicate the look and feel of the missing tooth. It is a strong, long-lasting fixture that will match your natural teeth and give you a healthy and attractive smile.